10-9-8-7-6-5-4-3—- How long will it be before we can get our passports stamped for space travel? The countdowns are on for “space experiences” here on earth and out in the cosmos. John Spencer, the founder of the Space Tourism Society took time to share with experiential Luxury Travel Maven Lisa TE Sonne some of his knowledge, predictions, and space architecture drawings. He also provided some helpful links for enthusiasts ready to buy tickets. Q: How would you define “space tourism”? A: John Spencer- The Space Tourism Society (STS) has a wide definition of “space tourism.” We use a triangle chart to show the three main market segments. First is real space tourism, with private citizens paying to fly into Sub-orbit and Earth orbit, and eventually including Lunar fly-bys and Lunar expeditions. To date, seven people have paid and flown into Earth orbit to stay aboard International Space Station (ISS) for about ten days. One person has flown twice, making a total of eight voyages. The second segment is made up of Earth-based, immersive space simulations or space attractions, such as NASA visitor centers, Space Camps, and space/science museums. Third are media-oriented space experiences, such as TV shows, movies, games, and virtual worlds. Q: What can people do now as a “space tourist”? A: John Spencer- The most recent private space traveler to fly was in September 2009. There is a waiting list of people who can afford the $45 million cost, but the only place they can go is the ISS. It currently has six full-time astronauts and cosmonauts on board, with two return vehicles docked there. Each vehicle can only carry three people, so there is no room for private space travelers. It is assumed the next place people can visit in Earth orbit will be a Bigelow Aerospace facility, which could be operating within five years. Space Adventures has already flown 7,000 people on the zero-gravity aircraft it operates. The Russians also operate zero-gravity flights for the public. Virgin Galactic anticipates flying paying passengers on sub-orbital flights starting in late 2013 or early 2014. There are several space attractions on Earth, plus hundreds of science and technology centers and museums around the world. More people annually visit space-themed attractions than visit the two Universal Studio Movie Parks (11 million people). Q: When it comes to space experiences, what do you predict will be possible for the affluent and curious traveler within five to ten years? company are also planning space hotels. Space walks (floats) will be offered for extra training and operations cost. Space Adventures is planning the first privately-funded lunar fly-by within the next five years, at a cost of $150 million for a ticket. One of two has been sold already. Sub-orbital flights will also start within this timeframe. The first 1,000 people milestone to do sub-orbital flights will be reached. It’s possible the first sub-orbital sky dive will also happen within this time frame. 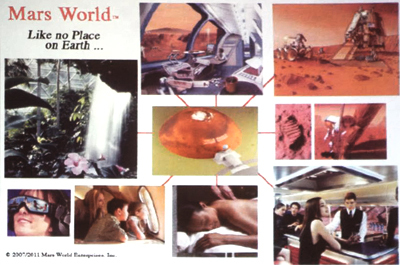 More and more Earth-based immersive space resorts and spas will also come on line. We may succeed in funding our $1.6 billion Mars World attraction and resort for Las Vegas. More space and Mars camps are in the works, and there are major space movies and TV shows in production. Q: Why do you think Space Tourism is an important part of the future of luxury travel? A: John Spencer- Because it’s totally new, exciting, and inspiring. It attracts famous and wealthy people, which generates international media attention. For the next 100 years, we will be doing new and exciting forms of space tourism, including Lunar tourism and eventually adventure tourism to Mars and the asteroids. Space sports will also become an important part of the growing space experience economy. Q: How would you describe luxury space travel? A: John Spencer- I have modeled the space tourism industry after the high-end cruise lines and ocean-going super yachts. As such, I see luxury space tourism providing the same high quality experiences and services as these models. Fine food, private accommodations, personal services, and fun, facilitated activities. Highly trained staffs focused on the passenger experience in addition to the crew that operates the space ships or lunar resorts and spas. 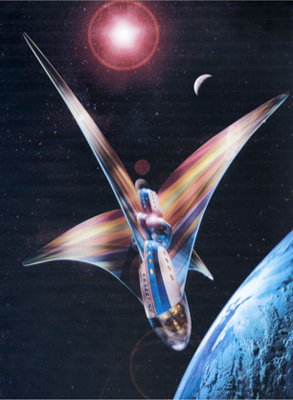 Q: Why do you think space travel will follow model set by the cruise lines? A: John Spencer- In 1982 I realized space tourism would be the largest private business off-world because people want unique and different experiences. I also realized that the cruise liners were the perfect business and operations model for space tourism because they are in the experience business and not the transportation business. Cruise ships are large and complex pieces of equipment designed to operate safely (not counting the Italians) and profitably in an extreme environment (the ocean) providing a wide variety of luxury oriented experiences. Q: You’ve even designed a “Super Mega Yacht” for space travel. Can you explain how it is different from other vehicles? from inflated sections fused together. It’s designed to be a very beautiful ship. She would be the first of her kind, leading to a large variety of orbital and lunar space yachts and racing yacht designs. 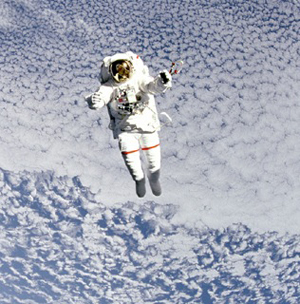 Q: Which companies are developing space tourism for private citizens? Q: How can people be involved in the Space Tourism Society? When and where are your meetings? 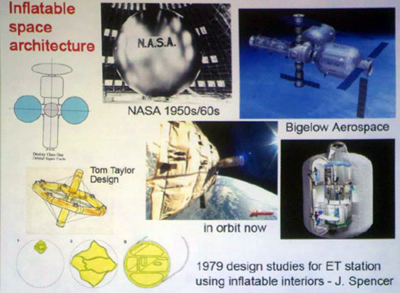 A: John Spencer: Attend our Space Experience Economy (SEE) Seminars and join the Society. We are just now starting our STS/SEE Seminar sponsorship program, so companies and people can become sponsors. The best thing is to look at our brand new STS website for more information.